The history of calligraphy in Japan dates back to the beginning of writing. In the beginning there was no written language in Japan. 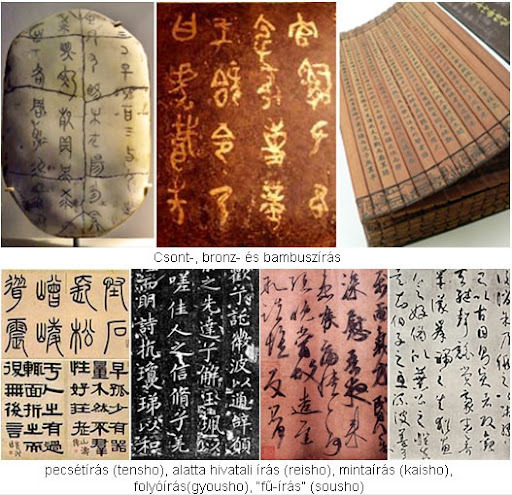 Around 5 A. D. a tendency of importing the Chinese writing system began to develop. Japanese literati men started copying and studying Chinese texts and wrote in Chinese. Concurrently they began to use the Chinese writing system to represent their own language. They started using kanji (Chinese characters) in a way so that they fitted the Japanese language. Since Japanese language – unlike Chinese – is an agglutinative language, they needed to create affixes to define the words’ meaning and grammatical function. In doing so, they began using certain Chinese „loanwords” or characters, disregarding their meaning and using them purely for phonetic purposes. Each character was used to represent one Japanese syllable. There also existed a type of writing, a syllabic script where Chinese characters were used for their sounds in order to transcribe the words of Japanese speech syllable by syllable. Eventually (in the 9th century) this system was simplified, giving rise to the evolution of the kana syllabaries. By the 10th century syllabic writing had already become widespread and in the 11th century an unique, distinctively Japanese form of calligraphy emerged. In spite of the above, for over centuries Chinese still remained the dominant language in literary circles, influencing it greatly. Although printing had been present in Japan since the 8th century it could not replace the more widespread duplicating methods or calligraphy until the 16th century when book printing began. Nevertheless, calligraphy prevailed and it played an important role in woodblock printing. Shotai (書体), a type of calligraphy written in Chinese characters is still widely practised in Japan. The different writing styles are the reflections of the historical development of writing in China. Tensho, archaic or seal script, first appeared on seals during the Quin Dynasty (221-206 BC). Reisho or clerical, official scriptwas used in official documents. These are ancient Chinese calligraphy styles which had not been used in Japan until the Edo era when the studying of Chinese culture and literature became popular among learned men. Kaisho or regular script, on the other hand, was much more widely-spread. It has survived until the present day and it is a style used in modern typography. Gyōsho or semi-cursive script is a softer and faster form of the kaisho script, in which the strokes are joined together to form a more rounded whole. This style is often used in informal texts. Sōsho or grass script is a highly cursive, sweeping style of calligraphy written with swift strokes where the characters flow into each other. Due to this, character sizes in the writing tend to differ in size, which further enhances the dynamism and artistic value of the writing. Although calligraphy styles may have changed over the centuries, the method of calligraphy practice and the tools used have remained almost unchanged. The two basic types of brush, futofude (thick brush) and hosofude (thin brush) are used. With futofude the artist writes the calligraphy and hosofude is used for writing fine cursive scripts or for signing the calligraphy work. Sumi (ink) is still prepared much the same way as it was hundreds of years ago. Kanji is the name of the adopted Chinese characters . In modern Japanese language there are about 2000 basic kanji and there is also Kana, a syllabaric writing system. In Man’Yōshū (万葉集), a poetry anthology from around 759 CE it can clearly be seen how Chinese characters, or kanji, were used purely for their phonetic purposes to represent Japanese syllables.This evolved into the so-called man’yōgana (万葉仮名) writing style. In modern Japanese language there are two types of kana. Hiragana characters are used to „overcome” the differences in Japanese and Chinese grammar and also to write words that have no kanji. Children are first taught hiragana at school . Katakana characters are used for foreign words or names borrowed from countries other than China. It is sometimes referred to as „scrivener”-style as it was used by scriveners in offices. In certain texts kaisho is sometimes referred to as „block” style. Ink sticks are made from pine soot using other procedures that include mixing with glue, drying and molding. To make liquid ink, the ink stick is rubbed in water on an ink stone until the required shade of black colour is attained.